Karna Parva describes the appointment of Karna as the third commander-in-chief of the Kaurava alliance. The Parva recites how war begins to tire and frustrate everyone, triggers angry shouting matches between Yudhishthira and Arjuna - brothers who otherwise love each other. This book describes how brutal war leads to horrifying behavior over the 16th and 17th day of the 18-day Kurukshetra War. At the end of the parva, Karna is killed in a fierce battle with Arjuna. Karna Parva includes a treatise by Aswatthama which focuses on the motive of the deeds of human life. The crowning incident of this Parva is the final confrontation between Karna and Arjuna, in which Karna is killed. This Parva (book) traditionally has 96 adhyayas (chapters). The eighth book of the Mahabharata praises Karna's warrior abilities. He defeated four of five Pandava brothers - Yudhishthira, Bhima, Nakula and Sahedeva. However, Karna did not kill any of them in order to keep his promise to Kunti - the biological mother of Pandavas and his - to not harm his four step brothers, but only kill Arjuna (see Udyoga Parva). Yudhishthira became upset with Karna's action and behavior on the battlefield, criticized Arjuna for failing everyone during the war, and particularly by not engaging Karna. This upset Arjuna who reminded Yudhishthira, in Chapter 70 of Karna parva, that Yudhishthira's addiction to gambling was at the root cause of everything - from their exile to this unnecessary war. Krishna intervened between the two brothers and reconciled them. On the second last day of the war, Karna and Arjuna engaged in a mortal fight, in which Karna was slowly gaining upper hand. Both were fighting using their celestial weapons then karna cuts the string of Gandhiva 11 times, he also injures Shri Krishna with 5 shafts and Arjuna with 3 which made him loss of sense for some time. Karna's chariot sank into earth. Karna stepped out to remove the wheel, asking Arjuna to suspend their battle, as the agreed rules of just war required. 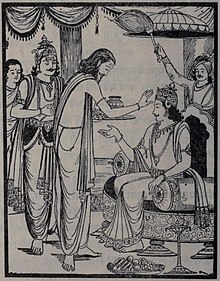 However, Krishna told Arjuna that Karna had no right to the rules of a just war because Karna and Duryodhana had consistently violated those rules of justice before the war, including when the game of dice was played and when Draupadi was dragged to the royal court by hair. Karna hung his head in shame but continued the fight on a tilted chariot, even making Arjuna swoon. While Arjun was unconscious, Karna decided to utilize the time in extracting the wheel of his chariot. Krishna knew that it was the only time possible to kill Karna, else he was invincible. Arjuna responded with Anjalika Astra, killing Karna. Karna was the third commander-in-chief of Kauravas during the Kurukshetra War. Shown above is his coronation ceremony. Karna Parva was composed in Sanskrit. Several translations of the book in English are available. Two translations from 19th century, now in public domain, are those by Kisari Mohan Ganguli and Manmatha Nath Dutt. The translations vary with each translator's interpretations. Clay Sanskrit Library has published a 15 volume set of the Mahabharata which includes a translation of Karna Parva by Adam Bowles. This translation is modern and uses an old manuscript of the Epic. Passion, engagement, skill and policy - these are the means to accomplish objectives. Many people maintain that morality can be learned from the scriptures alone; I do not find fault with that, but then everything is not provided in the scriptures. Moral precepts have been made for the well bring of all creatures. Moral precepts have been made to free the creatures from all injuries. Dharma - morality - is so called because it protects all. Morality saves all creatures. That is moral that keeps creatures from injuries. An untruth spoken to save creatures from injuries is in the cause of morality, and does not amount to a falsehood.